Astronomers surveying the nearby Andromeda galaxy have discovered an association of stars in its outskirts, which they believe to be part of a separate galaxy that merged with Andromeda about 700 million years ago. The discovery corresponds to computer models created by University of Massachusetts Amherst astronomer Mark Fardal, which simulate a dwarf galaxy merging with Andromeda. The findings suggest that Andromeda’s outer swathes of stars are from the same parent galaxy, and may help astronomers determine the Andromeda’s total mass. Both findings were presented Jan. 7 at the American Astronomical Society meeting in Seattle. Large galaxies are believed to be built partly by the merging of smaller galaxies, an event that destroys the smaller galaxy, explains Karoline Gilbert, a graduate student at the University of California, Santa Cruz, who presented at the meeting. The strong gravitational forces of a large galaxy can rip apart a small galaxy, producing loose streams of stars that astronomers call tidal debris. Measuring the amount of the tidal debris that exists in present-day galaxies allows astronomers to examine the role mergers play in galaxy formation. At a distance of 2.5 million light-years, Andromeda is the nearest large spiral galaxy to Earth and is very similar to our own Milky Way Galaxy. Spiral galaxies are made up of three main visible features: a flat disk of stars and gas, a bright central bulge of densely concentrated stars, and in some cases a faint, spherically distributed halo of stars that extends to large distances. Most of the mass of the galaxy, though, is made up of invisible or “dark’’ matter, detectable only through its gravitational force. Astronomers have discovered several areas in Andromeda’s outskirts that stand out for their enhanced density of stars, stellar features that are likely tidal debris from past galaxy mergers. 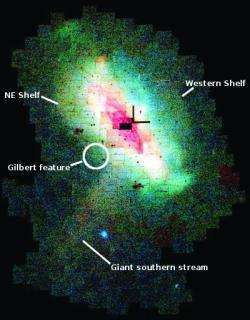 The two brightest features are a stream of stars to the south of the galaxy, called the “giant southern stream,’’ and a faint extension to one side of Andromeda’s disk called the “northeast shelf.” Until recently, these stellar features were not clearly associated. UMass Amherst’s Fardal developed computer simulations of the merger of a dwarf galaxy with Andromeda, building them to match observations of the giant southern stream and northeast shelf. The simulation also predicted other observed features around Andromeda, including a tidal debris feature in the same location and with the same range of velocities as that later discovered by Gilbert and her collaborators. “The tidal debris feature we have discovered is almost an exact match with the feature predicted in the simulations. This implies that this new stellar stream and the giant southern stream, as well as the other stellar features reproduced in the Fardal simulations, are all from the same parent galaxy,’’ said Gilbert. “In the model, the two galaxies first collided about 700 million years ago,” explains Fardal. The smaller galaxy had about 2 billion Sun’s worth of stars, but Andromeda itself has about fifty times that. “Eventually, the tidal debris from the satellite galaxy will smear out and be indistinguishable from the rest of the halo,” says Fardal. Because the stars in the tidal debris are moving together, astronomers can use them to measure the strength of the gravity around the Andromeda galaxy. Gilbert’s discovery of a new tidal debris feature, combined with velocity measurements of the other related tidal debris, will provide observations necessary to measure how much dark matter is in Andromeda and how it is distributed, explains Fardal. Gilbert and her collaborators are conducting a study of the stellar halo of Andromeda, using observations at the W.M. Keck Observatory and the Canada-France-Hawaii Telescope in Hawaii, and the Kitt Peak National Observatory in Arizona. Tidal debris features are usually found by inspecting images of a galaxy and identifying areas that have a greater density of stars than expected. The feature discovered by Gilbert is too faint to be seen this way. Instead, the group used the sensitive DEIMOS spectrograph at the Keck Observatory to separate light of different colors from individual stars in the halo of Andromeda. They could then measure the velocities of the stars from faint shifts in the colors of their light. The tidal feature showed up as a group of stars with similar velocities.